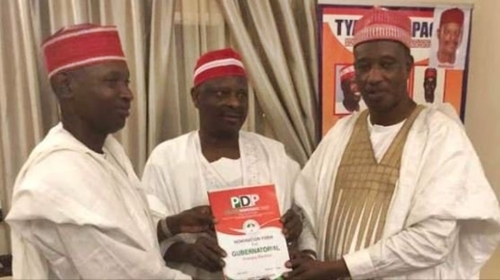 A presidential aspirant of the Peoples Democratic Party (PDP), Senator Rabiu Kwankwaso, has said that he wants Abba Yusuf (pictured left), his son-in-law, to succeed Abdullahi Ganduje, the incumbent governor, because Yusuf performed well when he served as a commissioner under him. Kwankwaso said Yusuf, who was commissioner of works, discharged his role well enough and was actually behind most of the projects of his government. The lawmaker listed the Kano Kofar Nassarawa flyover among the projects, adding that the projects designed by Yusuf were far better than the ones under Abdullahi Ganduje, his successor. Although Ganduje served as Kwankwaso’s deputy for eight years, both men have been having a running battle. “Today most projects being executed by Ganduje are not durable and are of low standard while heavy amounts was spent on them, but our projects which mostly were designed and executed by Abba Kabir Yusuf are today standing firm in Kano,” NAN qouted him to have said. Kwankwaso, who spent just one hour, appealed to his supporters to resolve issues among them amicably. “I’m in Kano to see you and say thank you for the brotherhood and progressive unity we enjoy as kwankwasiyya members. Certainly we will sit and talk on vital issues affecting us,” he said.